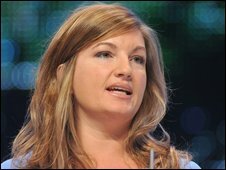 Managing director of Birmingham City Karren Brady "vehemently denied" any wrongdoing after she was rearrested as part of a corruption inquiry. City of London Police questioned Ms Brady, 39, as part of what officers say is an inquiry into "money laundering". In a statement, the football club claimed the investigation centred on tax matters involving two footballers. Ms Brady was previously arrested in April 2008 along with the club's co-owner, David Sullivan. She was rearrested while answering bail on Tuesday. City of London Police said those arrests were over allegations of false accounting and conspiracy to defraud and formed part of an "ongoing investigation into football corruption". A spokeswoman for the force said: "We have been working with HM Revenue & Customs (HMRC) from the outset of the investigation. "The investigation has always focused on money laundering. "The Fraud Prosecution Service has identified that tax offences may be involved." In a statement on the football club's website, chairman David Gold said: "I want to make this 100% clear that, as we stated before, this matter is all about PAYE and NIC on two players from 2002 and 2003, and absolutely nothing has changed. "The figures alleged to be involved are not substantial and not material to the company. "It is utterly wrong that this highly professional businesswoman has been made a victim in a witch-hunt against football. "During the last 10 years alone Birmingham City FC have made payment to HMRC of approximately £70 million and takes its financial responsibilities seriously." The club had issued a statement on its website which read: "Birmingham City FC would like to confirm that Karren Brady has not been charged with anything and vehemently denies any wrongdoing. "The new 'arrest' as stated by the police this evening relates to exactly the same two players that both David Sullivan and Karren Brady have already been arrested and questioned for and it simply confirms that the police are alleging PAYE and NI offences in relation to these two players. "The club continues to assist the police with their inquiries and have answered every question put to them." Mr Sullivan was not required to answer bail on Tuesday and Ms Brady was released on bail after being questioned. Police said a total of six people were on bail as part of the inquiry.